SOMERSWORTH, October 29, 2015 — The Somersworth Farmers Market wrapped up its first season on Thursday, September 24 and met its goal of improving access to fresh produce and reducing disparities to accessing healthy food. This season, SNAP/EBT members accessed a total of $5,799 to spend at the farmers market, $4,531 of which was distributed as free incentives through programs like market match and close the gap. Through the partnership with Seacoast Eat Local the Somersworth Farmers Market provided SNAP/EBT users with a weekly market match of up to $10. If a SNAP/EBT recipient spent $10 on their SNAP/EBT card they received an additional $10 free to spend on fruits and vegetables each week at the market. Additionally, all SNAP/EBT customers received $20 free to spend on food at the market during the last week of the month as part of a program called “Close the Gap.” Close The Gap aimed to bridge the gap between the time that SNAP/EBT recipients ran low or out of benefits, and when their EBT cards were refilled. The Somersworth Farmers Market was an initiative of the Strafford County Public Health Network (SCPHN) and Goodwin Community Health to address the obesity/nutrition public health priority identified by the Strafford County Public Health Advisory Council. Improving access to fresh produce and reducing disparities to accessing healthy food were the goals of the Somersworth Farmers Market that completed its first season last month. The success of the market was made possible by financial support from the Public Health Network and Stonewall Kitchen, partnership with Seacoast Eat Local and many volunteers from Goodwin Community Health. Additionally, the WIC program administered through Goodwin Community Health made a significant impact on the success of this market by assisting us in outreaching to its service population of SNAP/EBT users. 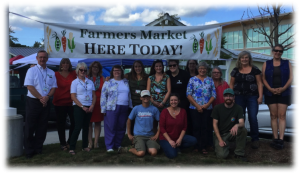 Local farmers, volunteers and staff of the Strafford County Public Health Network gather to close out the inaugural season of the Somersworth Farmers Market.